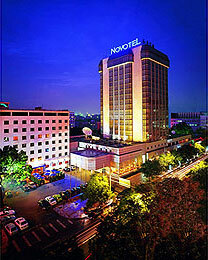 Novotel Peace Beijing is conveniently located in the busy Wangfujing shopping district, only 30 minutes drive from the airport. The hotel features 344 rooms, 4 restaurants, 2 bars, an indoor swimming pool, sauna and fitness centre. There are conference facilities for up to 300 delegates. Two of the citys major tourist attractions, the Forbidden City and Tiananmen Square, are only a short walk from the front door. 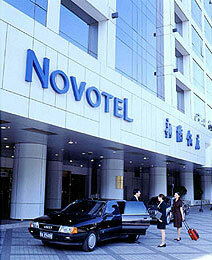 Novotel Xin Qiao is just a short walk from Tiananmen Square, the Forbidden City and the Temple of Heaven. The hotel features 700 rooms, 3 restaurants, a lobby bar, health centre, spa, sauna and full size outdoor tennis court. The subway station is only a1 minute walk and guests have easy access to shopping as well as business and government buildings. In the heart of Beijing, Sofitel Wanda Beijing provides easy access to the Exhibition Centre, subway and major attractions like Tiananmen Square and the Forbidden City. 30 min from Beijing Capital International Airport and 20 min from Beijing Railway Station, perfect for business or leisure travel, this platinum 5 star hotel features 417 luxury rooms (including 43 suites), 4 restaurants, 10 conference rooms with a Grand Ballroom of 1368 sqm, Health Club and Lancome Spa. Group inquiries are now open.